Workers at the BMW Mini plant in Cowley, Oxfordshire, say they now fear for their jobs after Britain's vote in favour of Brexit. The employees say they can't see why BMW would keep the plant open, when it will be cheaper to produce the cars in mainland Europe instead. Sir Gerald Howarth says he is 'absolutely ecstatic' that Britain has voted to leave the EU. The MP for Aldershot has campaigned against a 'United States of Europe' for the past 40 years. There was a wide range of views about the Referendum result on the 0722 Brighton to London this morning. Some rail passengers had spent the morning crying, while others cheered when they heard the results for the first time. Brighton as a whole voted overwhelmingly in favour of 'Remain' (68.6%). Full list of referendum results for Thames Valley. 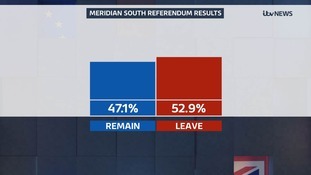 Overall the area voted 51.9% in favour of 'Remain'. PM: "No immediate changes for European citizens in Britain"
The Prime Minister has reassured European citizens living in Britain that there are no immediate changes to their status. David Cameron has also promised that there will be no immediate change to the way people can travel within Europe. The National Farmers' Union (NFU) has called on the government to put in new arrangements to protect British farmers following the vote to leave the EU. Many farmers in the South rely on seasonal workers from EU countries and more than half of British farming's income comes from EU subsidies. Our members will rightly want to know the impact on their businesses as a matter of urgency. We understand that the negotiations will take some time to deliver but it is vital that there is early commitment to ensure British farming is not disadvantaged. It is vital that British farming is profitable and remains competitive, it is the bedrock of the food industry – Britain’s largest manufacturing sector.